Mr Patel is a Consultant Plastic and Reconstructive Surgeon at the Leicester Royal Infirmary Hospital and treats both adults and children. He is an integral part of the plastic surgery, breast reconstruction and skin cancer teams. In addition to his reconstructive and microsurgery expertise, he has developed a special interest in cosmetic surgery of the breast, abdomen, body and face. 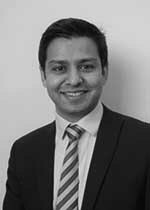 Mr Patel’s desire for Plastic Surgery started whilst at medical school at St Bartholomew’s and The Royal London School of Medicine and Dentistry. He has had world-class training in plastic surgery from London, Cambridge, Chelmsford, Norwich, Swansea, Stevenage, Nottingham and North America. During this time, he has completed six prestigious fellowships including Cosmetic Surgery, Laser, Skin Cancer, Breast Reconstruction and Microsurgery. Mr Patel has had the opportunity to work with and learn from some of the most distinguished surgeons in their respective fields. The keystone of Mr Patel’s practice is patient safety. He strives to ensure that best practice is followed in every procedure that he undertakes. Mr Patel has designed proformas and employed appropriate techniques to ensure better patient care. He combines cosmetic and reconstructive surgical techniques to get the best possible results for his patients. General adult and paediatric plastic surgery, skin cancer and reconstruction, microsurgery, hand surgery and laser treatment. Mr Patel is passionate about innovation in the medical field and being at the forefront of new techniques, materials and technologies that improve patient care. His enthusiasm has led him to be the Co-Lead for Innovation for the British Association of Plastic, Reconstructive and Aesthetic Surgeons (BAPRAS). Mr Patel is also one of a few nationally selected NHS Clinical Entrepreneurs with NHS England. He has gained numerous prizes for research papers and innovations and has been appointed as a Lecturer at the University of Manitoba. At present, he is in the process of inventing new surgical instruments that will help improve outcomes. Mr Patel is the author of two medical textbooks, one of which has been translated into Cantonese with Radcliffe and Blackwell Publishing Ltd. Mr Patel is currently writing a textbook, ‘Core Surgical Procedures at a Glance: Plastic Surgery’, to help train junior plastic surgeons. In addition, he has written three book chapters, six educational surgical videos and contributed to three surgical apps. He has also written over thirty peer reviewed papers and presented at over twenty national and international conferences. Mr Nakul Patel does not hold a share or financial interest in this hospital, another Nuffield Health hospital or the company. Mr Nakul Patel does not have a share or financial interest in equipment used at this hospital or another Nuffield Health hospital. Mr Nakul Patel does not hold any paid advisory role(s) at this hospital or on behalf of Nuffield Health.